A short drive from Varanasi (followed by a train connection from Gaya or an air connection from Patna), Bodhgaya seems an oasis in central Bihar, one of the poorest states in India. In perhaps 530-520 Bc (though the consensus on these dates is currently shifting), Gautama Buddha meditated under a peepul tree here until he achieved enlightenment. What’s believed to be a descendant of a cutting of that tree still stands, and in recent decades Buddhists from around the world have built monasteries nearby. In the winter months Bodhgaya teems with the faithful and the curious, particularly when the Dalai Lama is delivering lectures, usually in December. 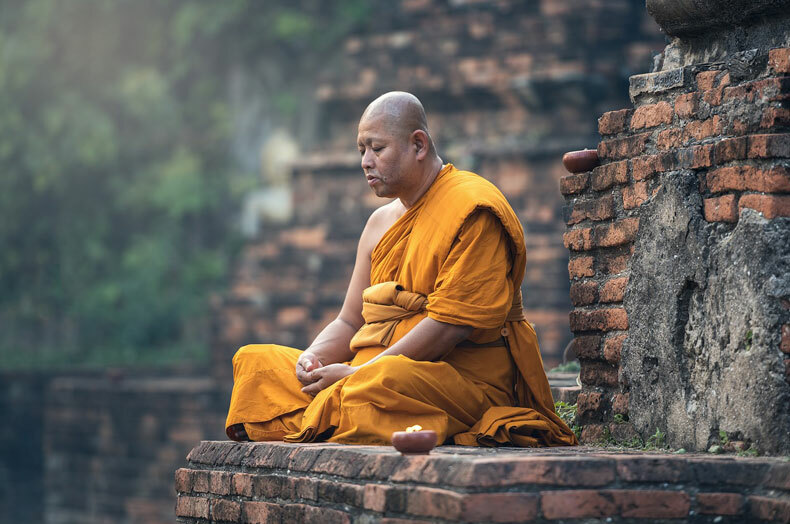 Around town you’ll encounter lay Buddhists from Maharasthra (center of a 20th-century Buddhist revival); Tibetan monks in maroon robes, some approaching the temple by prostrating themselves repeatedly; Sri Lankan and Thai bhikkus in yellow robes; and a growing number of Westerners. The contradictions between local poverty and the prosperity of these international monasteries have not been completely resolved; but most of Bodhgaya’s Buddhist institutions do run a school, a dispensary, or another charitable project, and the global spirit in Bodhgaya today in some ways reenacts that of Buddhism during its early Indian history. 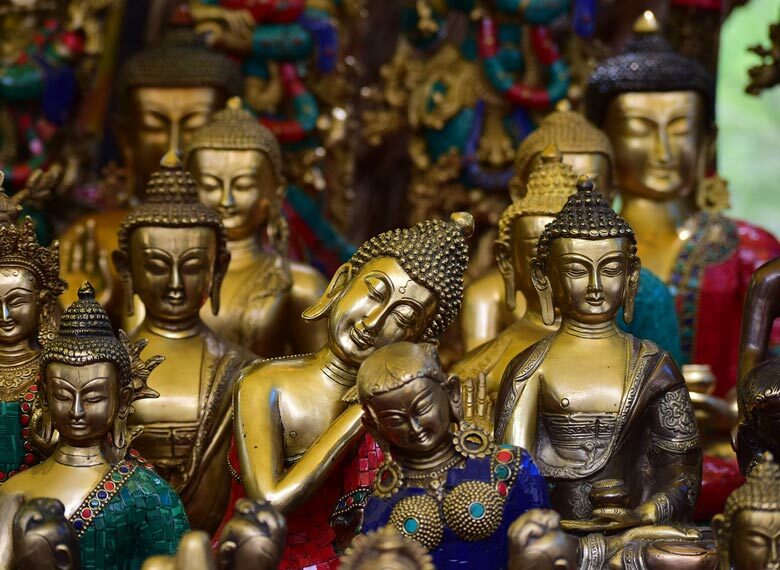 Since many of India’s other old Buddhist centers are primarily archaeological monuments, Bodhgaya gives you some idea of how Buddhism thrives as a contemporary faith. The Mahabodhi Temple is the physical as well as the symbolic center of town. Though it has been remodeled several times over the centuries, Mahabodhi may date from as early as the 2nd century AD and was certainly built before the 7th century, when the Chinese pilgrim Hsuan Tsang visited. It’s one of the earliest examples of the North Indian nagara style, which emphasizes the shikhara; rising some 160 ft, the spire can be seen far and wide from the surrounding flat country. The temple’s four flat sides are tiered with niches for Buddha images offered by pilgrims, though only a few of these are still here. At the top of the spire is a stone stupa, a representation of the reliquary mounds that the first Buddhists built all over the subcontinent, topped by a series of stone chattris, or parasols, symbols of both the Buddha’s princely lineage and the shelter provided by the faith he founded. You enter the temple down a long flight of steps through its eastern gate, which faces an attractive pedestrian plaza. The temple itself is en-closed on three sides by a four-tier carved stone railing, which opens under a high torana (archway) on the eastern side. Much of the original railing has been carted away to museums and replaced by less elaborate reproductions, but you can see examples of the carving here and there, and more in Bodhgaya’s archaeological museum. Pilgrims typically circumambulate the temple before entering the tall central chamber, which now houses a large gilt image of the Buddha in meditation. (According to Hsuan Tsang, in his day the image was made of a sandalwood paste.) The sanctum is strung with colored lights, and the surrounding space is enlivened by the obvious emotion of pilgrims. The Bodhi tree, standing outside the temple directly behind the inner sanctum, gives a more visceral feeling of sanctity. The railing around the tree forms a small courtyard, and pilgrims enter through a gate to place flowers on the stone slab representing the vajrasan (“diamond seat”) where the Buddha meditated and to tie bits of colored cloth to the tree. Contemporary Buddhists often sit in emulation of the founder’s practice along the railing under the tree. Dotted around the large temple compound, shaded by several trees, are small stone stupas sponsored by pilgrims over the centuries. The pathway of carved stone next to the north wall is said to mark the track of the Buddha’s walking meditation, and he is thought to have bathed in the pretty lotus pond on the southeast side. The area around the temple compound is a mixture of shops for pilgrims, simple restaurants, and international monasteries, each built in the style of its home country. You can cover Bodhgaya on foot or in a cycle-rickshaw. The main Tibetan Monastery, representing the Dalai Lama’s gelugpa tradition (or Yellow Hat Tradition) is on the north side of town; the man himself teaches under a large tent in an adjacent field. The Mahabodhi Society, a Sri Lankan organization that played a key role in reviving the practice of pilgrimage to Buddhist centers in India, has its complex on the main road just across from the temple’s northern wall. The attractive Thai Monastery is at the southern end of town. Bodhgaya’s Archaeological Museum is also on the south side of town, off the short road leading up to the Hotel Bodhgaya Ashok; it holds some of the temple’s original carved-stone railing and some good classical sculpture. Rajgir was capital of the ancient kingdom of Magadha and site of the first Buddhist Council in Buddha’s time. If you can stay in Bodhgaya overnight, the ruins of the great Buddhist University at Nalanda, northeast of Bodhgaya, make a long but fascinating day trip. For customized tour packages to the Buddhist pilgrimage destinations in India and Nepal contact Swan Tours, One of the leading tour operators in India since 1995.